So... does the cloaker lord seem okay to transfer to the main cloaker post now? Yes, just remove the "quadruple skill points at first level" part, and don't forget the image. Tecnically it should've been two levels long, but you're right that it has way too many abilities for so few levels (and the original monster it's clearly under-CR), so I'm willing to extend it to 3 levels. Good job! Added. And another feat while I'm at it. Proficiencies: Hydras are proficient with their natural attacks. Hydra Body: The Hydra loses all other racial traits, and gains the Magical Beast type which grants low-light vision and a 60 foot Darkvision. The Hydra also gains a natural armor equal to it's Con modifier, a 20 foot move speed and swim speed, and is medium sized. A hydra has no limbs capable of fine manipulation, and has only two legs for moving around. Hydra's Bite: The Hydra gains two bite attacks (from having two heads) at first level that do 1d6+Str damage. Every new level of the Hydra class gives it another head that can make a new bite attack. Regrowth: Whenever the hydra takes damage it instinctevely "parries" it with their long necks. If it takes enough damage, the head is severed and two new sprout from the stomp 1d4 rounds later. An Hydra cannot have more heads total than 2*(Hydra level+1). Hydra Level Percentage of max HP lost to grow an extra head. The hydra may grow several extra heads in one turn if it takes enough damage in a single turn. A 10th level Hydra with 100 HP who loses 50 HP would grow five extra heads. If the Hydra recovers HP, her extra heads wither and fall off at the same ratio it gains when hurt. So if the 10th level Hydra of the last example recovered 30 HP it would lose three heads. Ability Increase: The Hydra gains +1 Str and +1 Con at every level of this class. Fast Healing: A Hydra gains Fast Healing at 2nd level, equal to 1/2 it's HD. The Hydra may choose to not heal itself in order to keep extra heads. Growth: At 3rd level, the Hydra grows to large size. Her bite attacks also improve from 1d6 to 1d8 damage. At 4th level, the Hydra grows to Huge size and her bite attacks improve from 1d8 to 1d10 damage in a non-standard damage progression. Notice the Hydra is a long animal and thus her reach is only 5 foot at large size and 10 foot at huge size. Scent: As the standard SRD ability. Hydra Skills: An hydra gets +1 to spot and listen checks for each head the have. Hydra Hunger:The hydra may attack with all her heads as a standard action or in the end of a charge. Hydra Ferocity:The hydra can act normally when disabled or dying. If an hydra drops below -10 HP, it doesn't die untill her true head is striken. The heads are identical, thus the percentile chance to hit the true head is 100/number of heads. If the percentile chance is reached and the Hydra is left at -10 HP or less she dies. A character with cleave can re-roll this chance whenever it hits the Hydra. A character with greater cleave or whirlwind attack can cut all heads at once and auto-kill the Hydra if it's below -9 HP. An area-damaging spell also automatically kills the Hydra if it leaves her below -9 HP. Hydra Reflexes:The Hydra gains the combat reflexes feat even if it doesn't meet the pre-requisites, and whenever she's allowed an Aoo she can use all her bite attacks instead of just one. Hydra Healing:The Hydra's fast healing doubles. The Hydra can choose to fast heal less life than normal in order to keep her total number of heads. Lasting Heads:Extra heads last 1 minute now when the Hydra recovers HP. Magic Fangs:All of the Hydra's heads gain +1 Enachment bonus to attack and damage rolls. As a move action the Hydra can re-distribute her total enanchment bonus among her heads, as longas the total bonus is equal to the number of heads. No single head may be left with a bonus bigger than half the Hydra's HD, and no head may have an actual bonus to attack and damage bigger than 1/4 the Hydra's HD, altough the enanchment bonus can be used to replicate special effects like flaming and holy. So yeah the Hydra was one of those monsters that needed serious re-designing. It's rare for characters to have flaming weapons and improved sunder, but it's even more rare for monsters to have them to cut the PC's heads willingly. On the other hand, I had to put something that discouraged the player from choping his own heads to grow extras. So I made it tied directly to HP. You put your heads in the way of incoming, they fall, extras grows. The closer you are to death the stronger you get. Heal and you lose heads. And speaking of close to death, Hydra ferocity means you can keep going far on the negative HPs, but then each blow has a chance of finishing you off. Area effects finish you instantly. Removed the whole cauterizing wounds because the class is complicated as it is. It grows to huge size at lv4 yes, but between weak Bab, being a long, slow creature and having no hands it can't really do much with it. The Hydra is specially vulnerable to ranged oponents, altough the next prc may help on that. -At least 4 levels in the Hydra class. 1 +0 +2 +2 +0 Elemental blood, Hydra Breath. 2 +1 +3 +3 +0 Improved Hydra Breath. Elemental blood:Choose Acid, Fire, Electrecity or Cold. The Hydra gains that subtype and immunity to that element. Improved Hydra Breath: The Hydra Breath is now 10 foot long per HD and deals 1d8 damage per head, plus it gets a special effect based on the element chosen. Acid-Failed reflex save leaves damaged targets blinded for 1 round per HD. Fire-Failed reflex save leaves damaged creatures dazed for 1 round. Electrecity-Failed reflex save moves the damaged creature 5 foot per HD on a direction of the Hydra's choice. This movement causes no attacks of oportunity. Cold-Failed reflex makes creature move at half speed for 1 round per HD. Multiple failed reflex saves stack. And another feat while I'm at it. Great, now the monster goes from a fearsome enemy to "A Cloaker Lord! Kill it so I can grab it's juicy shaddow core!" You know, since you seem to like doing those monster feats so much, I would be willing to add them to other already existing monsters if inspiration strikes you. Give the shadow core an ego score, and have it wrestle with your mind if you try to learn spells from it? Hmm... how would a Hydra with the Multiheaded template work out? Name a monster. Any monster. Source? I'm pretty sure that's not a 3ed monster, but I'll take it on if it's a D&D monster and I have some statistics and fluff to base myself on. Skills: 2+int modifier, quadruple at first level. Class skills are Hide, Listen, Spot, Survival, and Swim. Proficiencies: Flail Snails are proficient only with their natural weapons. 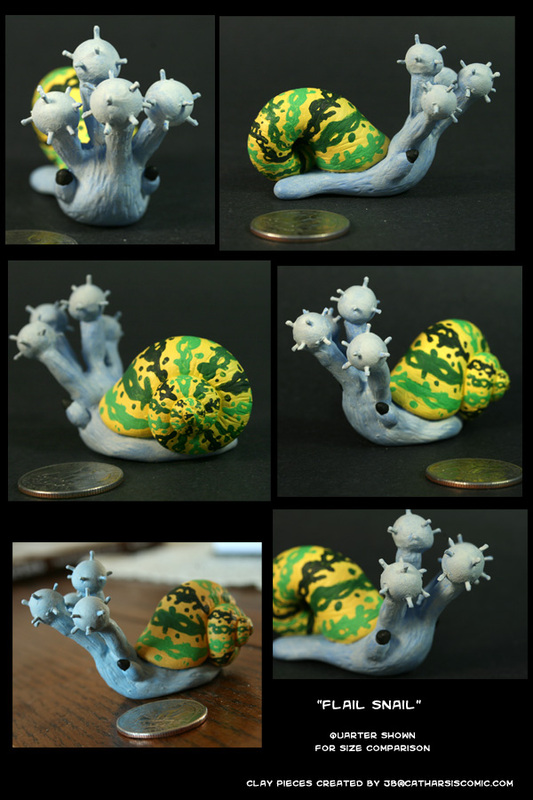 Snail Body: The Flail Snail loses all other racial traits and bonuses and gains vermin traits (Basically immunity to mind affecting effects and darkvision 60 feet) except that it retains an Int score. It is a medium sized vermin with a base speed and climb speed of 20 feet. It has three natural tentacle attacks dealing 1d6+str mod damage each, and it takes no penalty for attacking with all tentacles in a full attack. It does not have hands capable of fine manipulation, and cannot wield a weapon with it's tentacles. It also gains a natural armor bonus equal to 2+con modifier. Blindsight (Ex): Flail snails can ascertain all foes by vibration within 10 feet per HD. Light Blindness (Ex):Hydrobody(Ex): A Flail Snail is composed mostly of water. It's immune to fire and poison. Ability score increases: The Flail Snail gains one point of strength and one of Constituction each level. Tentacle multiplication: At second level, the Flail Snail grows an extra tentacle dealing as much damage as the others, and another tentacle for every 2 HD it has. Warp Magic (Su): Each time a spell is cast on or at a Flail Snail, it produces a random effect. Roll 1d10 and consult the table below. 1-7 Spell misfires; nothing happens. The Flail Snail may choose to let benefical spells pass trough Warp Magic. Whitdraw:At third level, a Flail Snail may retreat inside it's shell as an immediate action, doubling it's natural armor bonus and granting a bonus on all saves equal to it's Con modifier, but unable to attack, move or any other physical activity. Geting out from the shell takes a move action. The Flail Snail may choose to whitdraw in case a spell bypasses it's Warp Magic ability. Straight from D&D 1st edition, the Flail Snail is clearly the result of a "A very drunk wizard did it". It's slow, but tough, and hits hard with multiple natural attacks. Boosted the base speed because 10 base is just crippling for a PC. Tentacle multiplication is based on the original monster geting extra tentacles with extra HP, and Climb speed because it's a freaking snail. You also get blindsight and three immunities (poison, fire, mind-affecting) at 1st level. Now that may sound like a lot, but let's face it, it's slow, handless and has light blindness, so it needed some love from somewhere. Warp Magic is quite a powerfull defense against spellcasters, even if completely random on the original monster, and I added whitdraw because it's a Snail, so it should be able to do Snail-ish stuff. So if you want to play a giant snail that bashes people with it's tentacles and just keeps growing bigger and more tentaclary, the Flail Snail's for you! Skills: 6+int modifier per level, quadruple at 1st level.Proefeciencies:only it's own natural attacks. Aboleth body(Ex): At 1st level, the Aboleth loses all other racial bonus and gets aberration traits(darkvision 60 feets basicaly). He's a medium sized aberration creature with base speed 20 foot and a swim speed triple of it's base speed. It has two natural tentacle attacks dealing 1d4+Str damage each. The Aboleth grows one extra tentacle as a natural attack for each 3 HD it possesses (3 tentacles with 3 HD, 4 tentacles with 6 HD, 5 tentacles with 9 HD, ect). The Aboleth takes no penalty for attacking with all his tentacles in a fullattack. The Aboleth also gets a Nat armor bonus equal to his Int or Cha modifier, wichever is higher. Whenever the Aboleth permanently grows one size category it's Natural Armor increases by 1. The aboleth has no limbs capable of fine manipulation, but can use his tentacles for somatic components of spells. Anphibious(Ex): The Aboleth can breathe underwater permanently and doesn't take any penalty for acting underwater. Memory of the eons(Ex):Aboleths have the impressive racial trait of inheriting their ancestors memories. An Aboleth can only take ranks in Knowledge (eons), but that skill counts as any other knowledge skill (like Religion, Arcana, History) for all purposes, including sinergy bonus, qualifying for pre-requisites and finding out information. In adition, an aboleth who multiclasses for an arcane/psionic class can count his Aboleth levels as levels of that class for purposes of CL/ML and for the purposes of learning new spells/powers and geting new spell slots/power points. So for example, a Aboleth 3 who took 1 level of sorceror could choose to have CL 4, get 3 2nd level spell slots, 1 1st level spell slot, 1 2nd level spell known and 1 0th level spell known. He wouldn't get the spell knowns and spell slots of a sorceror 3 however. He would get the familiar ability, but mind flayer levels wouldn't count for it. Mysteryous Mind(Su):The Aboleth can use hypnotic pattern 2/day as a SLA for each HD it has. Save DC is 10+1/2HD+Cha mod. Ability Increase(Ex):The Aboleth gains +1 Str and +1 Int at levels 1, 3, 5, 7 and +1 to Con and Cha at levels 2, 4, 6 and 7 for +4 Str, +4 Con, +4 Int and +4 Cha at level 7. Ancient Mind(Su):The Aboleth can now use Illusory Wall and Mirage Arcana as SLAs 1/day for each HD it has, save DCs are 10+1/2HD+Cha mod. Mucus Cloud (Ex):An aboleth underwater can surround itself with a viscous cloud of mucus roughly 1 foot thick. Any creature coming into contact with and inhaling this substance (ending turn adjacent or grappling with the Aboleth) must succeed on a DC 10+1/2HD+Con modifier Fortitude save or lose the ability to breathe air for the next 3 hours. An affected creature suffocates in 2d6 minutes if removed from the water. Renewed contact with the mucus cloud and failing another Fortitude save continues the effect for another 3 hours. If an Aboleth leaves water the mucus Cloud lasts 1 minute per HD after wich it dries and becomes useless. Taking a full body "bath" renews the mucus assuming there's available water to fully cover the Aboleth. Aboleths are immune to this ability. Growth:At 3rd and 6th levels the Aboleth grows one size category, notice it is a long creature. If all Aboleth levels were taken, it grows another size category at 11 HD and 16 HD. Overwhelming intellect:At 3rd level the Aboleth's brain gets stronger the bigger it is. It receives +1 CL at all it's SLAs and spells for each size category it is bigger than medium, and oponents take a -1 penalty on saves against the Aboleth's spells and SLAs for each size category they're smaller than him. Deep Mind:At 4th level the Aboleth can now use Persistent Image and Programmed image as SLAs 1/day for each HD it has, save DCs are 10+1/2HD+Cha mod. Slime (Ex):Enslave(Su):Eternal Mind (Su): The Aboleth can now use Project Image and Veil as SLAs 1/day for every HD it has. In adition now True Seeing and similar effects that would automatically pierce illusions only work against the Aboleth's spells and SLAs if the user is whitin 10 feet of the illusion itself. The Aboleth is a bigger fish with mind powers and tentacles, but isn't exactly a swimming mind flayer. First I made it non-water dependant so it can still act on a ground campaigns, altough it does get some bonus for being on water. The Aboleth's SLAs are fully focused on illusions, and then it gets Mucus and Slime for some melee capacity. I made the Slime act faster so it's actualy usefull in combat and the Mucus lasts some time out of water, plus clarifying what it's needed for someone to breath it. Another problem it's that the Aboleth is huge, wich is actuly a liability for spellcasters. Overwhelming Intellect gives it a reason for making himself a big target. Lots of score increases and good skill points, but it has no hands (altough I put a clause to let it use tentacles for spellcasting) and one single good save. Kudos to TheGeckoKing for Memory of the Eons. So if you want to play a huge fish with mind powers that's smarter than most land dwellers then the Aboleth's for you. Skills: 2+int modifier, quadruple at first level. Class skills are Balance, Hide, Listen, Move Silently, Spot, Survival, and Swim. Proficiencies: Monstrous Crabs are proficient only with their natural weapons. Crustacean Body: The Monstrous Crab loses all other racial traits and bonuses and gains vermin traits (Basically immunity to mind affecting effects and darkvision 60 feet) except that it retains an Int score. It is a medium sized vermin with a base speed of 40 feet. It has two natural claw attacks dealing 1d6+str mod damage each, and it takes no penalty for attacking with both claws in a full attack. It does not have hands capable of fine manipulation, and cannot wield a weapon in either set of claws. Crab Grab: If the monstrous crab hit an opponent that is at least one size category smaller than itself with a claw attack, it deals normal damage and attempts to start a grapple as a free action without provoking an attack of opportunity. In adition the monstruous crab ignores freedom of movement effects on his oponents. Ability score increases: The monstrous crab gains one point of strength and one of Constituction each level. Powerful Claws: At second level, the monstrous crab's claw attacks do+1/2 HD extra damage. If it scores a critical with a claw it adds 1,5 times his strenght modifier instead of just 1. Additionally, it gains a racial bonus on grapple checks equal to its HD. Swim: The monstrous crab gains a swim speed equal to its HD times 5, although it cannot swim faster than its land speed. Amphibious:The monstruous crab can breath underwater indefinitely, and does not need to make constitution checks to avoid drowning. It takes no penalty for fighting underwater. Constrict: With a successful grapple check, a monstrous crab can crush a grabbed opponent, dealing damage equal to its claw damage. It may constrict each grabbed opponent once per round, including the round it grabs the opponent. Done by flabort from GITP, some tweaks by me. ^ Perfect for high-realism campaigns set in ancient Japan. But needs an ability which increases the crit multiplier of any weapons used against it by 1. Weak Point: A Monstrous Crab's massive damage threshold is reduced by 1/2, but adds its HD to the total. Thus, a 1st level Monstrous Crab has a massive damage threshold of 26, a 2nd level crab has a threshold of 27, and so on. Outsider Traits: An Astral Stalker loses all racial bonuses and traits, and gains outsider traits (mainly Darkvision 120ft). It is a medium sized creature. It has a basic speed of 40ft, and a climb speed of 10ft. Lastly an Astral Stalker receives a bonus to its armor class equal to its constitution modifier in the form of a natural armor bonus. Camouflage(Ex): An astral stalker can use the hide skill in any sort of natural terrain, even if it doesn't normally provide cover, or concealment. Sneak Attack(Ex): An astral stalker can make a sneak attack like a rogue from level 2,dealing an extra 1d6 points of damage whenever a foe is denied it's dexterity bonus, or the stalker is flanking. This increases to 2d6 at level 5, and 3d6 at level 8. Poison(Su): From level 2, An astral stalker can naturally produce poison, that can be used to coat either his claws, or his throat darts. The poison is applied as a swift action, and lasts till the end of that turn. This ability is at will. Poison: Injury; initial damage=Paralysis 1d4 rounds; secondary damage=none; Fort save DC scales at 10+1/2HD+con modifier. At 10 HD the poison's secondary damage increases to another 1d4 rounds of paralyzis, and it now ignores immunity to paralyzis and/or poison from any source, altough oponents with that ability gain a +5 bonus on their saves against the Astral Stalker's poison. Throat Dart(Su): From level 3, an astral stalker gains the ability to fire a throat dart at will, this deals 1d4 points of damage, and can be poisoned (see above). This ability improves every 3HD, so at 6HD the dart does 2d4, at 9HD 3d4 and so on. The range of this dart is 150ft with no range increment. The Astral Stalker may shoot extra throat darts in a single turn with iterative attacks, rapid shot, haste and similar abilities. Strength Increase: From level 3 and every 3 level after that an astral stalker gains +1 to his strength. Elusive Prey(Ex): An astral stalker is notoriously difficult to track, anyone attempting to track an astral stalker takes a penalty on survival checks equal to his HD, and the Astral Stalker receives a bonus on saves against any divination spells and effects equal to 1/2 his HD. The Astral Stalker even gets a Will save against Divination spells that normally don't allow a save (DC=10+spell level+Highest mental stat of the caster), but it doesn't gain the extra bonus in those cases. Grace of the Hunter(Su):At level 5 An astral stalker can add it's charisma modifier as a bonus to it's armor class as a deflection bonus. Hunter advantage (Ex): At level 6 an Astral Stalker adds his Strenght modifier to Hide and Move Silently checks. An Astral Stalker doesn't take a -20 penalty on hide checks for attacking while hiding. Charisma Increase: From level 4 and every 4 level after that an astral stalker gains +1 to his charisma. Perfect Tracker(Ex): An astral stalker can move at it's normal speed while tracking without taking the normal -5 penalty, it takes only a -10 penalty (instead of the usual -20) when moving at up to twice normal speed whilst tracking. It also ignores track penalties due to terrain and can track any kind of creature trough any kind of enviroment, even a ghost trough the emptyness of the Ethereal Plane. DR/Magic(Ex): From level 7 an astral stalker gains DR/Magic, this scales at 1/2 the stalkers Hit Dice. Observe the Prey(Ex):For every round an Astral Stalker lays still observing an oponent, it gains a +1 bonus on attack rolls, damage rolls, saves, skill checks and ability checks against that oponent, for 1 round per Cha modifier after the Astral Stalker moves. Evasion(Ex): An astral stalker can avoid even magical and unusual attacks with great agility. If it makes a successful reflex saving throw against an attack that normally does half damage on a successful save, it instead takes no damage. Unearthly Grace(Su): At level 11 an astral stalker gains his Cha modifier as a bonus on all saves, and no longer fails saves or attacks on a natural 1. -All of the target's racial plus class abilities. -All of the target's magic buffs, feats and skill ranks. -All of the target's gear. The Astral Stalker can use Hunter Eye multiple times against one oponent, and doesn't risk learning the same thing twice. So three sucessfull atempts would reveal all of the above. Done by FyreByrd, some final tweaks by me. -Must be a living sentient creature with at least 3HD and 10 Str, 10 Dex, 10 Con and 10 Cha. -A character able to manifest 5th level or higher level psionic powers must perform a week-long special ritual on the creature, costing 100 GP for each HD. Optional:Spend 1000 GP per HD, or 10.000 GP per HD instead. Class Skills: See Anima Body of the Artifact. Proficiencies: A guardian gains no new weapon or armor proficiencies. Anima Extinguished (Ex): The character's charisma score drops to 1. If the 1000 GP were spent the character is treated as under a permanent dominate monster effect from the one who performed the ritual. If the 10.000 GP were spent then the character comes completely under control of the one who performed the ritual and must obey it's orders blindly whitout saves ever allowed. Body of the Artifact (Ex): Unlike other monster prestige classes, you lose your racial traits and previous levels and their associated bonus (except skill points and feats, see below). You then gain both Guardian levels and after that Psion, Psychic Warrior levels and/or any Prestige class for wich you meet the pre-requisites (your choice) untill you reach your old number of HD, except that all your levels give a d10 HD and you retain your old skill points and class skills plus feats (some of them may become useless due to your new nature). Any class level taken after this gives normal skill points. You don't gain new feats just for re-taking your levels. For example, a 3rd level character could become a guardian 2/psion 1, but not guardian 1/psion 2. A 10th level character could become a guardian 2/Psion 8, but not a guardian 1/Psion 9. You gain the below construct traits and are a small sized contruct with no movement ability, thus having no Str, Dex or Con score. [spoiler] * No Constitution score. * Immunity to poison, sleep effects, paralysis, stunning, disease, death effects, and necromancy effects. * Not subject to critical hits, nonlethal damage, ability damage, ability drain, fatigue, exhaustion, or energy drain. * Immunity to any effect that requires a Fortitude save (unless the effect also works on objects, or is harmless). * Not at risk of death from massive damage. Immediately destroyed when reduced to 0 hit points or less. * Since it was never alive, a construct cannot be raised or resurrected. * Proficient with its natural weapons only, unless generally humanoid in form, in which case proficient with any weapon mentioned in its entry. * Proficient with no armor. * Constructs do not eat, sleep, or breathe. In adition you gain an extra +1 HP per HD if you have 5 or more HD. At 10 HD this bonus retroactively increases to +2 per HD, and +3 per HD at 15 HD. A guardian must still meditate 8 hours per day to recover it's daily power points. You receive -5 penalty to AC and Reflex Saves for being immobile but gain a bonus to Nat armor equal to your highest mental stat. As an immobile object you have no working limbs. You can still see and hear but not talk. You can only take purely mental actions (like manifesting powers). 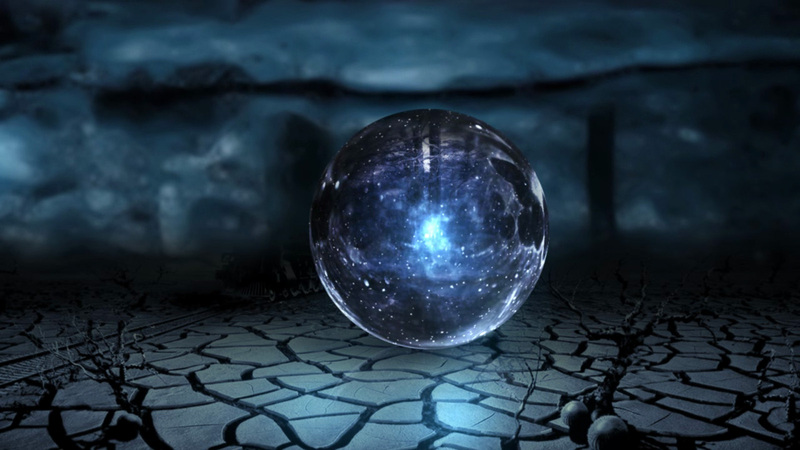 Altough the typical Guardian is an obsidian sphere it's body can be built in any shape and material the creator wishes as long as it's small sized and it suceeds on the apropriate craft check. This never changes the guardian abilities. Immortal Artifact (Ex): A guardian doesn't ages. It has DR/adamantine equal to it's HD due to it's compact shape. In adition, a guardian standing still looks just like a part of the scenery. It takes a Sense motice, Search or Knowledge(psionics) check with a DC of 20+HD to recognize it as a construct. When a guardian manifests powers, it takes a Spot check DC 10+1/2 HD+Highest Mental Stat to recognize it as the source of the power, unless the observer is adjacent to the guardian, in wich case it feels a "tingle" on his head pointing at the Guardian revealing it as the source of the power, so it still needs to make Concentration checks to avoid attacks of oportunity from adjacent enemies. Psionic Might (Ex): Guardian levels stack with levels in one manifesting class in order to determine effective manifester level, learning new powers and the number of power points gained for each new level, but doesn't retroactively give power points and powers known. So for example a guardian 2/psion 1 could choose to gain 5 power points per day and learn two up to 2nd level powers instead of three 1st level powers. Guardian levels wouldn't stack for any other psion ability. Jewels of the Ether (Ex): A guardian can custom make or have custom-made magic items for it, though the at double the market cost. These treasures take the form of semi-tangible orbs of ectoplasm and ether that float about them like ioun stones. A magic item that relies on its physical form or shape in order to achieve a purpose (such as weapons, armor, shovels, carpets, etc) will not generally function in the shape of an ethereal ioun stone (though secondary functions might still apply). In adition, the Guardian automatically knows the Psionic Repair Damage power. It can use it to craft items from surrounding materials (assuming it has the necessary skills/feats), altough this fully drains his MP for the day for every day of work. Immortal Mind (Ex): At 2nd level the guardian gains a +1 bonus to Int and Wis.
Rolling Stone(Ex):When push comes to shove the Guardian is capable of some limited locomotation. It's capable of moving at a speed of 20 foot per round by rolling around the ground, altough no part of it actualy moves. It still has no Str/Con/Dex scores so it can never deal damage or use combat maneuvers with this movement, anyone can grab it, and it's still unable to use movement skills like tumble, climb and jump, so something like falling inside a pit it's a dead end. It could still block an oponent's path. It never threatens anyone or grants flanking bonus. The objective of the Guardian template is to turn the Character into a small sized limbless sphere. What can you do as a limbless sphere? Not much really. Besides psionics. Since you lose your original body and your mind is stuffed into a ball you lose all your previous levels, but you get to gain free levels automatically to replace them. There's a precedent of this on the Blackguard. The original objective of the Guardian template was to create almost mindless servants, but since playing that isn't that fun I put a clause the creator needs to pay an arm and a leg to assure control. The PC will be thus a "budget" guardian, with it's own will. But the possibility of the PC converting oponents into his toys is still there. As finishing touches you get high DR for making up for your lack of regular defenses, easily blend with the scenario untill you manifest, and a small bonus for taking your time doing stuff. Class Skills: 4/level (x4 at level 1) Balance, Climb, Handle Animal, Hide, Jump, Knowledge (Nature), Listen, Spot, Survival. Proficiencies: Owlbears are proficient with their own natural weapons. Drunken Mistake (Ex): At first level an Owlbear loses all racial traits and features, and gains the Magical Beast type with all traits decided by that (basically darkvision 60 feet). It is medium sized with a base land speed of 30ft. It has two primary claw attacks that it may use together as a standard attack without penalty. Each claw deals 1d4+Str damage. It also gains a secondary peck attack that deals 1d6+1/2 Str damage. It gains a natural armour bonus equal to it's Con Mod. Owlbears are vicious and relentless; attacking anything bigger than a mouse on sight. Owlbear levels stack with Barbarian levels for determining uses of Rage/day, as well as stacking towards the levels needed to access Greater & Mighty Rage. Track (Ex): The Owlbear gains Track as a Bonus Feat. Strong as an Owl (Ex): At each level the Owlbear gains +1 Strength. At each even numbered level it gains +1 Constitution. Scent (Ex): At second level the Owlbear gains the Scent ability. Great Owlbear(Ex): At third level the Owlbear grows to Large size. Screech (Ex): At fourth level the idea of blending a natural predator like the bear with something as unconventional as an owl finally starts to make sense.